The library was funded by a donation from Huaxia Bank, and was constructed by students from the bank's MBA programme. This use of unskilled labour necessitated a design that was simple to construct for novice builders in a timeframe of just one week. "The design scheme of the library had to respond the special requirement of the construction process," explained Dot Architects, which was able to call on 46 volunteers to help with the build. 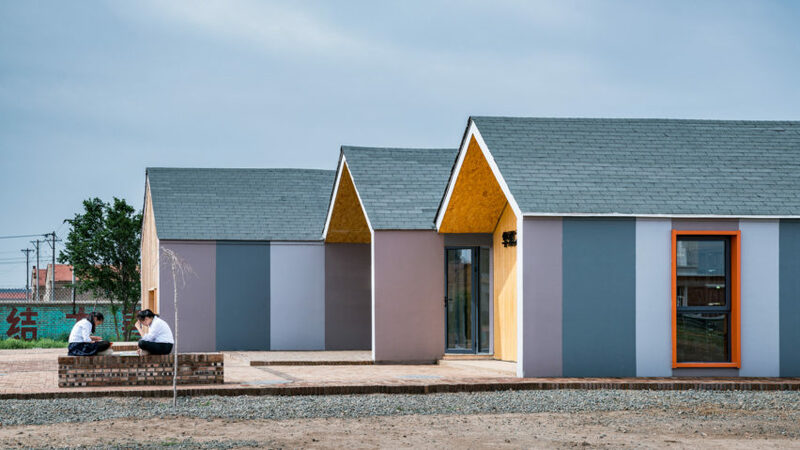 The library is based on an open-source system developed by the Wikihouse Foundation, which provides downloadable blueprints for simple structures that can be constructed quickly and straightforwardly. Dot Architects previously utilised the system when designing a futuristic concept home in Beijing, while London studio Hawkins\Brown used it to install 21 modular workspaces on the site of the former broadcast centre at the Queen Elizabeth Olympic Park. The pre-fabricated buildings comprise modules that are assembled in a factory, where the structure and insulation are combined with external and internal walls. Once the modules are delivered to site, they can be craned into position and simply fixed to the main structural frame. Multiple modules combined in a row create elongated volumes with a uniform section. The library comprises three identical pitched volumes that are arranged in a row and staggered slightly in plan. Each structure's gable wall is recessed to create a sheltered porch at the entrance. The northern structure contains the library shelves, with a public space and courtyard occupying the central area, and the southern block housing a reading room. An adjoining pergola provides a shaded outdoor space. "The library blends into the local context with the typical triangular gable-shaped strip, yet its staggered arrangement and inner patio achieve an interesting and interactive space for the campus," the architect added. Plenty of windows incorporated into the facades ensure the spaces feel bright inside. The rooms are clad in chipboard panels that follow the gabled shape and create a sense of uniformity throughout the building. The building process was supervised by the architects along with specialists in wood construction. School staff and pupils were responsible for installing the furniture, and the books were donated by Huaxia Bank along with other charitable organisations. Danish architecture firm COBE recently completed a wedge-shaped library for a school in a deprived suburb of Copenhagen, and Gonzalez Moix Arquitectura designed a community library in Lima with columns shaped like books on shelves.